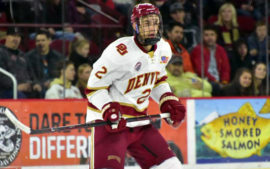 Denver junior defenseman Erich Fear has been named the recipient of the Elite 90 award. 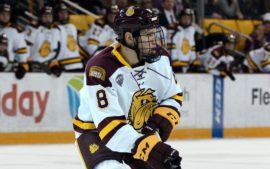 In three years, Fear received his undergraduate degree in finance with a 3.97 cumulative GPA. The Winnetka, Ill., native is currently pursuing a master’s degree in accounting. Fear has two goals and three assists with 48 penalty minutes through 63 career games with the Pioneers. He has one goal and two assists with 10 penalty minutes in 37 games this season.